Christmas has come and gone, but celebration is still in the air! While we hope all our dear players had a great time in the game during Christmas, our immediate concern however is the arrival of 2016 and the excitement that comes with it. To welcome the new year, Magerealm is proud to introduce 3 events that will start everyone’s year off with a bang. First and foremost is Snowman Collection! What’s winter without snow? Brave champions in Magerealm feels pretty much the same way. During this event, snowman will be dropped every hour all over Oaklane and Starmoon Isle. Collect them to receive Gold and Amethysts. Players can draw alphabet letters from the slot machine. 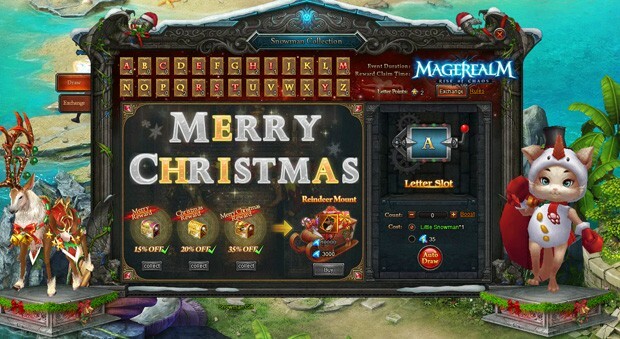 If they are lucky enough to spell out Merry, Christmas or Merry Christmas, they can win treasure chests containing great prizes and a great discount on the Reindeer mount! We hope everyone is happy with their Christmas presents this year, but there can never be enough presents! 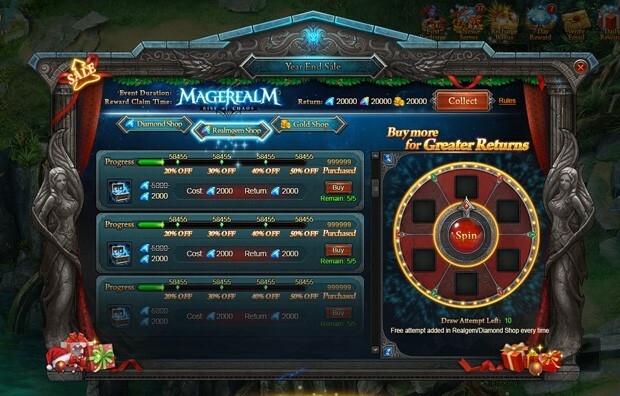 So for the second event this week, Magerealm is introducing Group Buy. Players can now have up to 50% off on purchases in Gold, Diamond and Realmgem shops. The more people that join in the purchase, greater the discount. The more you buy, the greater your return because the shop gives you a chance to win great rewards as you spend.What’s more fun than going on a shopping spree with your friends? The most exciting function that we are bringing is the Mage Fund! Players can purchase a fund at the price of 10000 Diamonds. Each day they can claim great rewards such as large amounts of Gold and Amethyst with part of the diamonds they spent to purchase the fund. So on the last day of the event, they will have gotten all their Diamonds back and received much more! Great gifts for free? Sign me up! All these events we present to our dear players to wish them a great 2016 and to celebrate Magerealm winning the ‘Best Strategy Game’ award hosted by mmosite. Of course we wouldn’t have been able to do it without your love and support. We are forever grateful! Happy new years and thanks for playing Magerealm.